With the approach of the 50th Bermuda Race next year, we’ve been looking back at the long history of the 635-mile “Thrash to the Onion Patch” since its founding in 1906. One highlight has long been the very enthusiastic, and sometimes very successful, participation of young crews from service academies. When it was first suggested that the US Naval Academy enter a boat in the Bermuda Race, a captain who was a fierce teetotaler worried that the midshipmen might be corrupted. “It is my understanding,” he warned, “that after the conclusion of such a race, a rousing celebration usually takes place in Bermuda and the yachtsmen endeavor to forget the hardships of the voyage.” Others were willing to take the risk of exposing mids to Dark ‘n Stormies (under close supervision) and so the Academy accepted the race’s invitation to enter a boat in 1938. That feeling has been shared by hundreds of first-time ocean racing sailors who, on shore, wear uniforms. Entries in recent years have come from the Massachusetts Maritime Academy, SUNY Maritime Academy, the US Coast Guard Academy, the US Merchant Marine Academy, and the US Naval Academy. The Coast Guard Academy’s Glory has twice topped the competitive J/44 class, and has won three trophies as second- and third-place service academy boat in the race’s St. David’s Lighthouse Division. Many service academy cadets and midshipmen have sailed the Bermuda Race in boats that were donated by their owners. 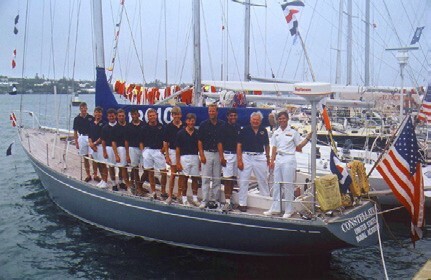 One was the race’s overall winner in 1992, the Naval Academy’s PJ-48 Constellation. Her 22-year-old captain, Kyle Weaver, is the youngest winning skipper in Bermuda Race history. And, yes, he was the skipper. In these boats, the racing crews consist entirely of midshipmen, with safety officers/coaches who keep hands off except in dire emergencies. Recent custom boats in the Naval Academy offshore fleet include high-performance TP 52-footers. Such a modern light-displacement, big-rig boat must be sailed exactly right if she is to perform well, much less stay in control. This demands aggressive trimming, frequent sail changes, and skillful steering. In the windy, record-setting 2012 race, the Academy’s TP 52 Invictus’ top speeds were 24 and 22 knots (both with women mids at the helm). Nearing Bermuda, Invictus was knocked down in a 53-knot squall, the jib disintegrated, the mainsail’s leech parted company with the rest of the sail – and the young mids cleaned up the mess so capably that Coach Jahn Tihansky was not tempted to take command. Invictus skipper Midshipman Ralph Duffett said the best thing his crew had going for them was experience sailing as a team. Since April, they and other USNA crews had done a cruise around the Delmarva Peninsula, and made at least 40 practice crew overboard recoveries. Each USNA offshore boat annually puts about 3,500 miles of water in her wake, often in races. Physical demands were lighter in 2014, but shifty winds imposed intense pressure on sail trim, sailing angles, tactics, and meteorology. The USNA’s TP 52 Constellation was right up front with the big boats and ended up fourth on elapsed time in the 163-boat fleet, beating several larger competitors to the finish line off St. David’s Light. Alongside the Naval Academy’s donated boats are many one-design 44-footers. From the 1930s to the 1980s, these were Luders-designed yawls. Then came a run of Navy 44 sloops designed by McCurdy & Rhodes. More recently there’s a second generation of Navy 44s designed by David Pedrick. The top service academy boat on corrected time in the St. David’s Lighthouse Division is awarded the Destroyers Atlantic Trophy. In four of the last five races, it was won by Swift, a first-generation Navy 44 under different midshipman skippers. Her toughest competitor is a second-generation 44, Defiance, the top boat of the academy fleet in 2012, when she also won the Olin J. Stephens Award for best combined performance in Newport Bermuda and Marblehead Halifax races. That year Swift and Defiance finished second and third in the St. David’s Lighthouse Division, and they were often within sight of each another. We can expect more of that from the service academy boats when they make the thrash to the Onion Patch in 2016. 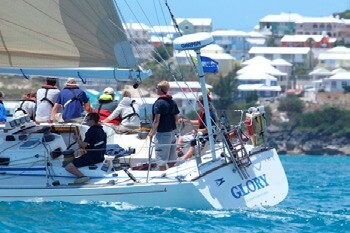 For information about the Newport Bermuda Race, log onto BermudaRace.com. John Rousmaniere is the Bermuda Race Historian and the author of The Annapolis Book of Seamanship¸ Fastnet, Force 10, and several other books.